I have tried to shed light on this blog before and many times on the Omicronlab forum. But new users continue to be at-a-loss-what-to-do when they see only boxes instead of the Bengali letters. Or the Bengali script appears anyway, but the vowel signs may not show in the correct order! First, make sure you have the Bengali Unicode fonts installed. 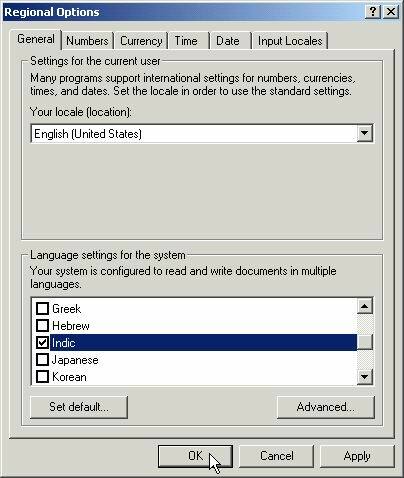 Windows XP / 2000 – Windows XP doesn’t come pre-enabled with support for Bengali, or any other Indian language for that matter which are ‘complex scripts’ anyway. So you need to install the pack meant for complex script for which you will need the Windows installation disc. Note:- If you are scared (or too lazy) to tinker with these language settings, then you can use this very useful third-party tool that will install the necessary files with a single-click. Windows Vista / 7 – Windows Vista and Windows 7 come with in-built support for Indian languages.